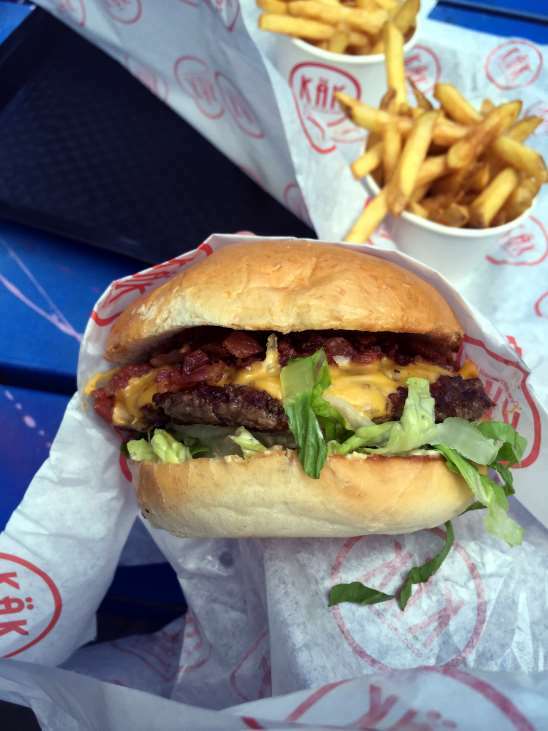 Harmurgers has been the trend in Stockholm for a while and there are plenty of burger restaurants to choose from, like Bun Meat Bun, Flippin’ Burgers, Vigårda, Svenska Hamburgerköket, Lily’s Burger, Prime Burger Company and Käk. Recently I visited Käk on Södermalm in Stockholm for a burger. Käk has gotten a lot of press because one of the owners are Petter (http://www.petter.nu/) who is probably one of Sweden´s most prominent hip-hop artists. A little star quality doesn’t make it less interesting but you should also beware that Petter comes across as a very down to earth guy. This is not anything like Planet Hollywood, this is a small fast food restaurant with great burgers and great music while you enjoy them. 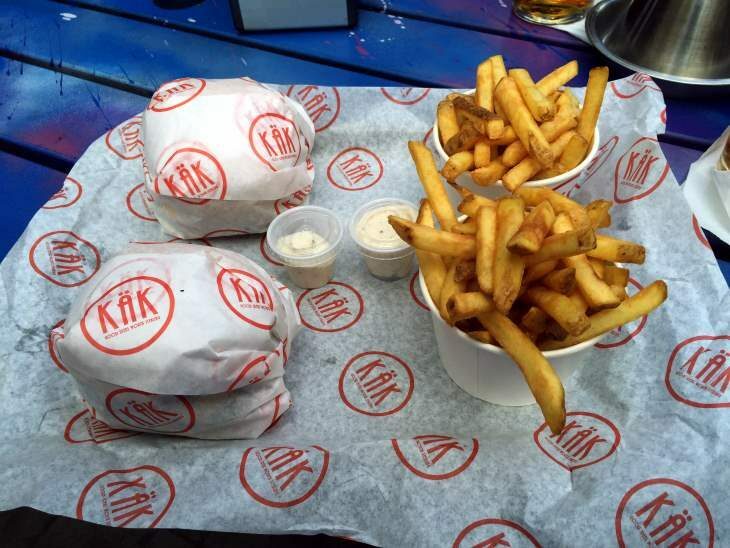 A hip-hopper without some attitude is a Bieber in disguise, so naturally Käk calls their burgers HKB Burgers which is short for “Håll-Käften-Burgare” and it translates to “Shut-the-F*ck-Up Burgers”. I tried HKB # 3 and it is a great burger at a great price point for a gourmet burger. In Sweden it is not very common to be able to get alcohol at a fast food joint but at Käk you can get both beer, wine and milkshakes with a shot of alcohol in them. The beer selection consists of a classic Lager, Falcon, and Carnegie Amber Ale which is a typical British ale. If Käk claimed to be a restaurant the assortment of beers would have been disappointing. As a fast food place, the assortment of beer is excellent (at least for Sweden)! Please visit käk.com for full menu. 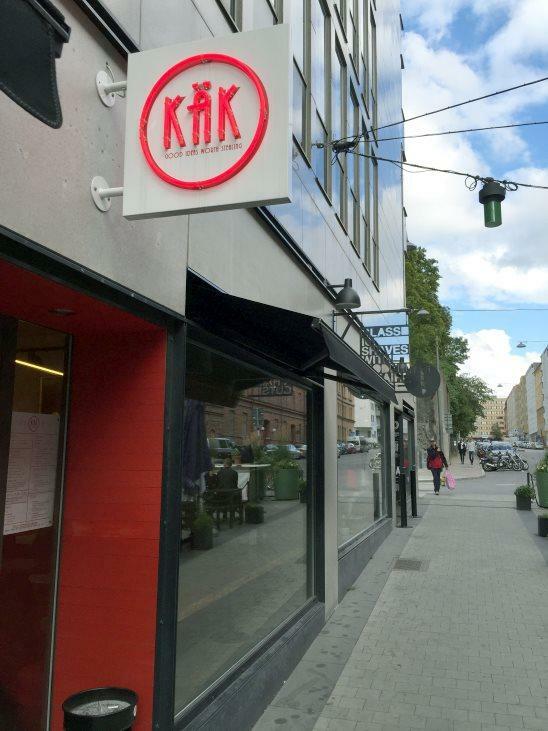 Käk is a great experience and highly recommended if you come for a quick bite. This is not a place to hang around for hours or for a date. Yes, you can bring your date for something to eat before the theatre/movie/exhibition and you will come across as a man of the world. Bring a date for this only and you will come across as cheap or a geek. For some the location might seem off but Hornstull is probably the most interesting part of Södermalm (South Island) right now with lots of up and coming restaurants, cafés, bars, flea markets and concert venues. If you are attending a concert at Debaser Hornstull, Käk is just a stone’s throw away. If you are looking for great burgers on Södermalm, Stockholm. Look no further! If you go, please let me know what you thought via email, in the comments below, on Twitter, Facebook or Google+. Do you like Sweden? If so, you might want to check out my other articles about Sweden. Guest Post: Varna In A Day. Petter seems to be a genuinely good guy, very sympathetic and I am pleased that his burgers are so too. It is not a huge place, just a nice burger joint well worth a visit. Stockholm has changed a lot the last 20 years and is def more cosmopolitan nowadays. You have direct flights out of Dubai with EK so there are no reasons not to go. Do not hesitate to contact me for some tips if you decide to visit Stockholm. Haha, I know what you mean. I am usually living in the south and has also been told to stay away from Stockholm. :) I promise you will have a great time in Stockholm!